An international association providing support for those affected by the Watchtower Society. ← Who Is There to Fear? Our First Anniversary: What a year it has been! Over a year ago, a group of compassionate and caring people began discussing the possibility of setting up a not-for-profit organization that would shine the bright light of truth on the Watchtower Society’s most harmful policies. Their organization would focus on policies that violate the basic human rights of Jehovah’s Witnesses. They would emphasize the protection of children and women relating to physical and sexual abuse – as well as from other forms of domestic violence. or on our Newsletters page. That in itself was a lofty goal. But they also decided that they would not overlook the Watchtower’s prohibition on the medical use of blood, their over use of extreme shunning, or their ongoing resistance to post-secondary education for JW children or adults trying to improve their skills and personal income. They knew they could not just focus on creating awareness about these unjust policies. They wanted to extend themselves and actually reach out and help ex-JWs and their families who had experienced abuse due to these Watchtower policies. They agreed to add a support element into this educational organization they created in April 2013. They understood that creating awareness would not succeed if they only directed their efforts toward Jehovah’s Witnesses (although many Witnesses have responded positively to the message). Their message wouldn’t be intended for members of the ex-Witness community either, because most of them are already aware and understand these issues. The Watchtower has been hiding the physical and sexual abuse of women and children within their organization for decades. Watchtower policies on blood transfusions are incomprehensible and often changing – resulting in a substantial number of needless deaths over the past 70 years for both children and adult JWs. The Watchtower’s expanded use of their unconscionable “shunning” policy has resulted in hundreds of suicides. Why? Often they’ve been due to the inhumane treatment former members experience because they choose to leave on their own or are excommunicated for breaking one of the many unreasonable rules that Witnesses must follow. Even though they experienced a few bumps along the way, with the help they received from hundreds of volunteers AAWA was able to create a series of videos, flyers and op-ed pieces for the media. Looking back, those were remarkable accomplishments considering many of us had never before met or corresponded – nor were we even aware of each other. I want to thank each one of our volunteers for the fabulous work they have done. I want to personally thank all the writers, artists, videographers and editors, members of our support team – and even those who just sent us their ideas or personal stories. I am in awe of all you for what you have helped us to accomplish this past year. Congratulations to all of you for your hard work and personal dedication. We know that we aren’t done yet. We still have other issues that we want to tackle. Blood, education and domestic violence will still be on our radar. We know that we have a few mountains to climb and with your help we will get over and past them. In the meantime, we have some real surprises ahead for our readers and supporters. We hope that you will be as excited about this new forum as we are. 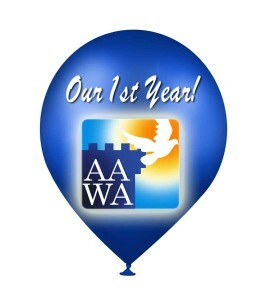 It will be accessible from both Facebook and directly from the AAWA.co website. If you already have a Facebook account, there will be no need to register separately – you can simply ask us to add you to the group. If you need privacy from your lurking Witness family members or others, please set up a second Facebook account and use a name they would not recognize. If you do not have a Facebook account, you will need to register with Facebook. Again, if you are at all concerned about lurking Witnesses, then please set up an account using a name they would not recognize. Do not post your picture or post enough information that would easily identify who you are. We must emphasize that THIS IS AN OPEN FORUM except for certain specific areas that will be private. This new forum will replace the existing discussion forum that now exists on the AAWA.co website. My apologies to those who are not comfortable with Facebook. We will do our best to provide a safe environment for you. I invite you to join us. Please contact me if you would prefer other options. So Happy Anniversary! to all of YOU who have helped AAWA educate the world community about Watchtower injustices during the past year. We know that our group will only be as good as those valuable and willing volunteers who have committed themselves to our mission. Ex-JW. DFed. A survivor of child sexual abuse, physical abuse and emotional abuse. Survivor of spousal abuse - sexual, emotional and financial. Survivor of sexual assault. And one last one - survivor of ethnic/political abuse. Left the first husband (JW) and lost my home. Left the second husband (never a JW) and lost my home. Wound up homeless for 9 months living out of one tiny room at the YMCA. But I still survive and thrive. One year (1) of AAWA existance compared with a 100 years now of the so called Invisible) reign of Christ by Watch Tower Society seems to be nothing! But, keep courage as the only difference are the two “ZERO” and two zero should not impress us! We still have a long way to go, but achievements in one year are remarkable!!! What about the progress of our petition? It seems the level of awareness of Watchtower abuses is still low!!! The Watchtower Society has claimed for decades that ex-Witnesses are organized. Until last year trying to organize them was like herding cats. But finally we are organized and the work is moving forward. Hopelessly Stuck in the Victim Mode? Your tax-deductible donation can help AAWA to continue to provide education, counseling, and support to qualified experts, groups and organizations advocating Watchtower reforms. Click on this map to see for yourself! AAWA.co will no longer be offering individual registrations on this website. Any exceptions will be managed by the Webmaster. All non-administrative registrations have been deleted. We encourage you to use our automatic blog subscription signup [Subscribe] in this panel to be informed about new articles and other announcements. You may also click the "followup" buttons after any Comments you make. You will be automatically notified of any additional replies or new comments. Advocates for Awareness of Watchtower Abuses.